For Y day we did 2 things- ate lots of yummy yogurt and yoga poses! The raspberry yogurt made a great, healthy breakfast for my Boo. 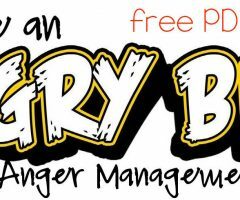 We even tried making yogurt Popsicles but ended up breaking our Popsicle tray (long story). 🙂 We tried doing some Yoga poses with these great cards I used for my second graders. My daughter’s favorite poses were the rock, the gorilla, and cat (ended up looking more like the cobra though). She had a great time and I did, too! 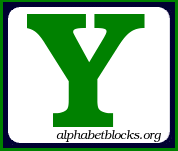 This entry was posted in alphabet, learningtime, literacy and tagged letter Y on August 1, 2009 by ktoponce. Earlier this month we picked up some old X-rays from Grandpa. Little Boo just loved looking at the black and white images of a hand and foot! That was so much fun! We also ate lunch at the hospital cafeteria and what just happened to be the shape of the butter??? An X , of course!! Perfect!!! I made some X-ray alphabet cards that went along with a file folder game. The file folder game suggested you print them in full size pages but I opted to make smaller, more compact cards that we could play with! 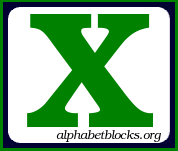 This entry was posted in alphabet, learningtime, literacy and tagged letter X on August 1, 2009 by ktoponce. First of all- THANKS so much for all those that have been blessing me with awards! You have no idea how far a little recognition will go… so please know I deeply appreciate it. Second, thanks to all those who are adding stuff to our WIKI! Yes, W day can not go without paying tribute to all those who are wikiing (is that even a word?) and adding some incredible stuff! THANK YOU!!! And the great thing is that we all get to benefit from your ideas! Don’t you just love sharing? I think it might have been more entertaining for me! W day wouldn’t be complete without some fun getting wet in the water. Little Boo splashed around and sprayed herself for quite awhile! 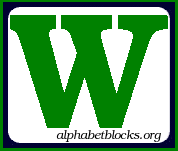 This entry was posted in alphabet, learningtime, literacy and tagged letter W on July 29, 2009 by ktoponce. Cut the toilet paper roll into 4 equal squares. Because this cardboard has been rolled up, it will make a great slope for your volcano. tape down to the plate as well as inside the container (AKA mouth of the volcano). Add the food coloring first. Then scoop in some baking soda. We put in the vinegar last- since this was a liquid and easiest to pour. Watch with amazement as your volcano erupts! Just watch out for curious little hands who want to taste test this bubbly concoction! We also ate veggies… yes, I took a picture but I won’t bore you with a picture of it! 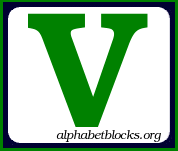 This entry was posted in alphabet, learningtime, literacy and tagged letter V on July 29, 2009 by ktoponce. 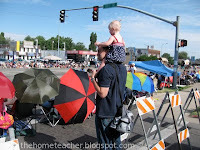 Utah pioneer parade in the morning- so HOT but lots of fun! Especially watching the news helicopters overhead! There were even some unicycles in the parade! 2. 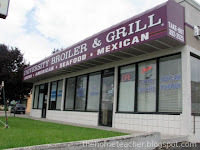 Went to our local university’s grill for dinner. 3. Posed for some pics by Daddy’s car since his license plates start with U! Since I am playing catch up on three letter days- I don’t remember if we did anything else for U day…. 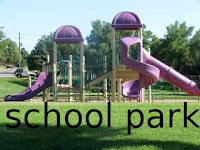 This entry was posted in alphabet, learningtime, literacy and tagged letter U on July 26, 2009 by ktoponce. made an egg carton train (idea from Preschool Express). This was a Mommy and Me project since Boo was more interested in painting the newspaper covering the table. 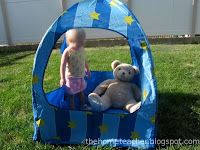 2. set up a small tent in the yard- I had this as a reading tent in my second grade classroom- because of our small house I don’t leave it up all the time, but it is fun to put up once in awhile and use as a toddler playpen! 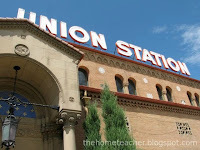 4. went to the local train museum- this was a fun field trip we took with my parents and brother. 6. learned (more like watched Mommy sing) I’m a Little Teapot. She calls it the “Pot” song :). 7. went to our local religious temple and took pics outside… despite the fact it was like 100 degrees outside, I wanted some pics of her in a little dress with ruffly socks and shoes. 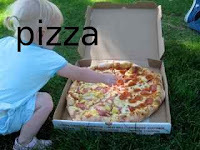 (I know I am such a mean momma!) Her favorite part of the temple? The water fountain! No wonder- she was probably so hot! All in all- fun T day! Happy Teaching!! 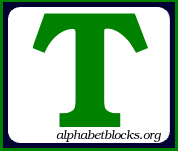 This entry was posted in alphabet, learningtime, literacy and tagged letter T on July 26, 2009 by ktoponce. There are SO many things that start with the letter S!! We had a hard time narrowing things down (our other activities that we wanted to do I will add to the WIKI for future reference. ATTENTION all parents whose children hate peas. TRY this at home: put an itsy bitsy amount of butter of hot peas. Watch as your child is amazed as it melts. My Boo ate FOUR servings of peas just so she could watch the butter melt!!!! 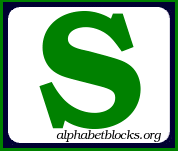 This entry was posted in alphabet, learningtime, literacy and tagged letter S on July 26, 2009 by ktoponce. R day already! WOW! Before going into our days activities, I am going to answer a question from Orange Juice. She asked a great question wondering if my daughter was understanding the concept and learning her letters. 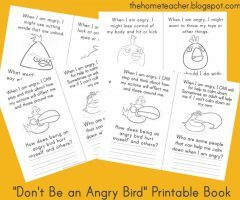 My Boo is almost 2- and I need to say that my intention in doing these letter days was just to get her feet wet and provide her with some alphabet schema or background knowledge. I am amazed at how much she is actually grasping. I would have to say she is about 75% accurate in letter sounds A-R and letter recognition is probably around 50%…. there are certain letters she knows really well- like D, M, X, K (sometimes mislabeled as an X). I plan on doing some sort of an assessment with her this week to see where she is at. I am trying to figure out her strengths and let her guide me with her education- so far I can say she is a great memorizer. 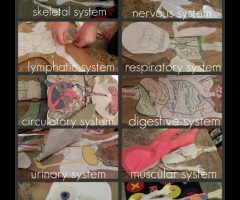 At the same time- I am trying NOT to go overboard with “school stuff” and provide her with a well rounded childhood. OK, lets review the letter R! we then matched the rocks on colored felt squares. 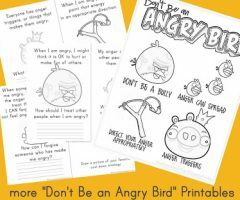 i thought that this would be easier than it really was…. my daughter just wanted to jump on the felt. she has bundles of energy ALL the time! We ate Ravioli for dinner and also ran around the table…. and of course we had some yummy rootbeer floats! The r sound is a little tricky for my little one to say- not as difficult as the L sound though. 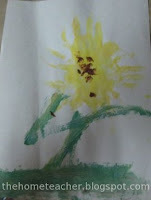 I had great plans for doing rainbow art with strings and some Montessori rice activities (as well as coloring rice) The day was too short for all that R fun! 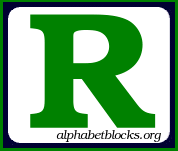 This entry was posted in alphabet, learningtime, literacy and tagged letter R on July 22, 2009 by ktoponce. This was quite the day- as far as letter learning is concerned! I have been nervous for Q day to come since we started the ABC days…. why, you may ask? 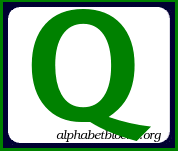 I am concerned about teaching my Boo the correct sound the letter Q makes. 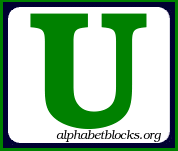 While most say “kw”, those familiar with digraphs and phonics know that without the u, the q says “k”. So which do I teach my daughter- the phonetically correct way, or the generalization? I ended up teaching her that the Q says”k”. But from her Letter Factory experience, she already knows “kw”. More often than not, u follows q and therefore makes that sound. I can’t stress over such a little thing! RELAX, Keri!!! She isn’t even 2 yet!!!! Here is a picture of our Q day project with q tips. We had fun painting and making a big mess! 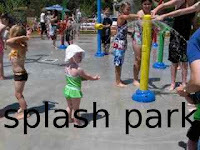 This entry was posted in alphabet, learningtime, literacy and tagged letter Q on July 22, 2009 by ktoponce. Friday was our letter P day! We had SO much fun! 3 different parks, 2 yummy picnics, and 1 banana flavored Popsicle! 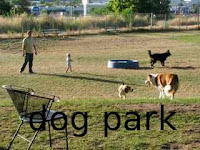 YES we visited three parks! My daughter was in heaven!!! Funny side note: a police car was following us after visiting the splash park- I thought we were going to get pulled over- luckily we didn’t! 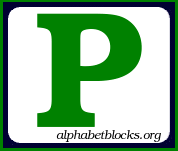 This entry was posted in alphabet, learningtime, literacy and tagged letter P on July 21, 2009 by ktoponce.